Mathias Jardin is a major figure of the French BJJ. 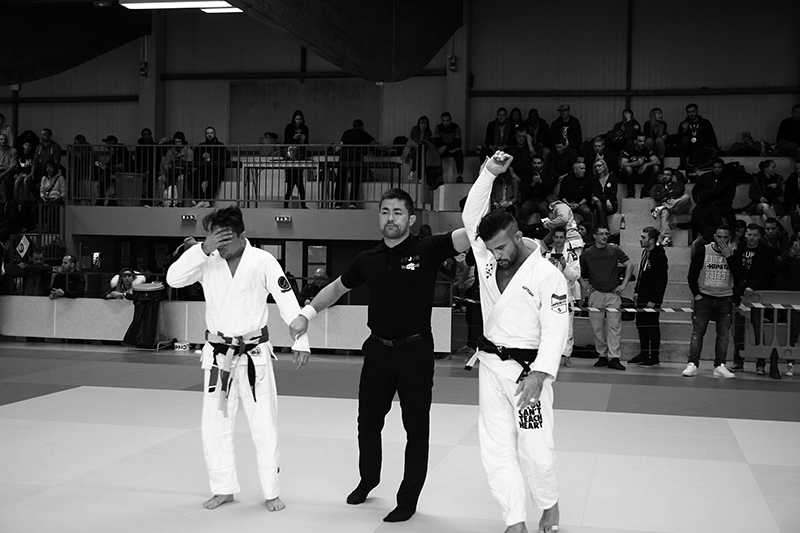 As a high level competitor, a IBJJF referee and as a trainer at GT Team France, he marks the French scene with all these functions and his commitment. When he came to Strasbourg for the North East French championship, I put-on my journalist hat to make you discover him differently. For this first article let’s begin with his fighter experiences and sacrifices. Before doing Brazilian jiu-jitsu, you practised judo and luta livre. What have you kept from these two martial arts in your jiu-jitsuka game? I kept many things from judo because I practice it since I was five years old and never stopped to train. I still train once a week in a high-level club even if I don’t compete anymore. Judo serves me well for my standing fighting. If it’s possible for me not to pull the guard, I prefer to keep the standing up position and try to throw my opponent. Beyond its technical aspect, judo built my life, my relation to other people: respect and fair-play but also having a healthy mind in a healthy body. The judo moral code really guided my life. When I was at high school I entered a “sport & studies” program. This kind of program offers French young athletes a schedule that makes the combination of many training and study hours possible (around 15 hours training per week). So, I practised judo at good national level, but I became uncomfortable with all the restrictions established by the refereeing rules. This is what made me want to do something else. I discovered ground fighting thanks to luta livre. I started it by chance and then discovered Brazilian jiu-jitsu. I keep from luta livre the teachings of Flavio Santiago, a Brazilian purist, and more specifically, a guard which is a mix of a half and a butterfly guard. I don’t think you can identify my game as a luta livre fighter game, but you can find within it these two elements. You had a high-level career in judo then in BJJ. In the movie “L’homme de l’ombre”, you say “if you are passionate, no matter what the sacrifices”. What have been your biggest sacrifices in order to manage these careers? I did a lot but it would be selfish talking only about me. I have been in a relationship for 7 years, I am married and have a child. I think my wife did the biggest sacrifices. She’s alone every evening and the weekends, and sometimes a full week. Before we had a child, it was fine but now she has to handle everything. There also have been diets for many years… Last Christmas I ate foie gras for the first time in 8 years. At least there are not big sacrifices, but it is rather a combination of many little ones. Diet has an influence on your mood, on your morality, on how you feel on D-day, your character… So, it might be annoying. Then there is the financial aspect. You cannot deny that, to manage to live from Brazilian jiu-jitsu, you have to spend a lot before earning some money. It takes time to get your break, to find sponsors and get refunded trips. So, you have to do many financial sacrifices before. I also wanted to learn from the best, so I spent 6 months in Brazil. Is it really a sacrifice? I don’t want to complain but there are, above all, human sacrifices. I stopped going out with friends before a competition because I needed to sleep and couldn’t drink alcohol, so I didn’t interfere with my preparation. With time my friends invited me less because they knew that “Mathias never goes out…”. I have built another relationship with them, I see them differently. So, your wife is a major pillar of your family. Actually, you say in the same movie that “to succeed you have to be well supported”. Who are the other pillars that support you to achieve your goals? When I said that, I didn’t only speak of my wife but in general. For me, a champion is made by a team. We practice an individual sport but there’s an amazing team spirit. Even if you are alone on the mat, it’s the team who wins. There’s a sentence I often repeat: we can’t arrive somewhere alone. The first one who counts a lot for me is my physical trainer Sébastien Calloud. He’s a judoka and trains me since I am 15 years old and he has a real credibility. In addition to his master’s degree in “physical training”, he’s a judo black belt and fights in the French first division. He’s also a BJJ and luta livre black belt. So, he tests all the preparation workouts himself first before training us. Then there are all my partners, students and teachers, who go with me each day on the mat. GF Team has a big competitors group and it’s great to have some of them, even blue belts, with such a level that I can lean on them to coach me or to make me work on new techniques. That group mentality is really amazing and helps me a lot. Still in that movie you also say, “if your dreams don’t scare you, they are not big enough”. Which of your dreams scares you the most at the moment? I love this sentence (laugh…). It’s a dream that seems inaccessible for me: be adult black belt world champion. It would be a real recognition, something nobody has done in France yet, apart Florence Cousin of the women’s. For men it’s not the case, even for a medal. I am scared about that and it appears unsurmountable to me. If you want to get more details about Mathias Jardin’s career, I invite you to read this article in Jits and to listen to the podcast on Castagne FM (both in French). I invite you to come back soon to discover more about his role as a referee and as a member of the French Brazilian Jiu-jitsu Confederation. You will also learn more about his coach position at GF Team France. Many thanks to my BJJ friend Guillaume for his pictures !